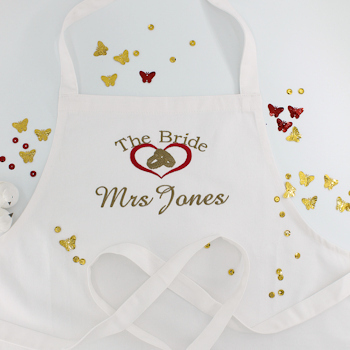 Personalised white Bridal apron to wear over your wedding dress while getting ready or for the Bride to Be hen party! We embroider The Bride over a love heart with wedding rings motif and a name or nickname underneath. We embroider The Bride over a love heart with wedding rings motif and a name or nickname underneath. Select a text thread colour for the wording. The white chefs apron is made from a sturdy 65% polyester and 35% cotton blend. Machine washable and tumble dry on low. Adult apron measures 72 x 86cm.